Trying out a new bento we got, review on it coming soon. I had a hard time filling it this morning and I'm not sure if that's because it's so much bigger than most of our other bentos or if it was the lack of sleep. Apparently no one told Ohio that it's spring now so of course it's freezing and rainy today. I left the windows open when I fell asleep and woke up as a popsicle! Top tier has egg shaped peanut butter and jelly sandwich and a side of yogurt with strawberry jam and sprinkles. The egg is decorated green with food coloring spray. 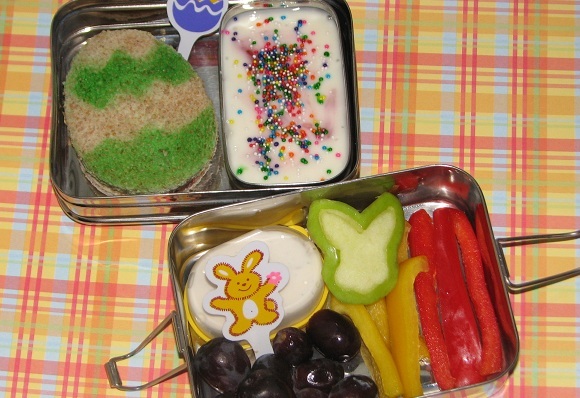 Bottom tier is grapes, apple bunny, red and yellow peppers, and a container of ranch dip. Looks like the EcoLunch box? Cute eggs and bunnies theme!